The eHR Sharing System provides an essential infrastructure for implementing the healthcare reform in Hong Kong. It provides an information infrastructure for healthcare providers in both the public and private healthcare sectors, with informed and express consent of the patient and proper authorisation for access to the System, to share the eHR they keep on the patient with other healthcare providers and to retrieve the eHR of the patient shared by other healthcare providers. Scope of sharable eHR data will be introduced by phases, to tie in with technical capability and the use of the System by healthcare providers. Clinic Management System (CMS) On-ramp is a clinic management system that is able to share patients'clinical data with the Electronic Health Record Sharing System (eHRSS). The CMS On-ramp application is in compliance with the eHR security, system interoperability requirements, and eHR information standards. Mr. Clube Ng has over 20 years in eHealth and ICT and he has actively engaged in the eHealth development in HK, Greater China and Asia Pacific in recent years. He has participated the HK Health Reform consultation and the development of territory-wide eHealth Record Sharing System since2008. He has also helped the organization of the Greater China eHealth Forum since 2011. Clube has assisted Asia eHealth Information Network to incorporate in HK in 2015. Clube is the chairman of Industry Liaison and Partnership SIG of Smart City Consortium, the Deputy Honorary Treasurer of Smart City Consortium, the co-opted board member of eHealth Consortium, the Working Council member of Asia eHealth Information Network, and the CEO of eHealth Research Institute Ltd.
(i)TVP aims to subsidise local small and medium enterprises (SMEs) in using technological services and solutions to improve productivity, or upgrade or transform their business processes. The programme will be implemented on a pilot basis for an initial period of three years from November 2016 with HK$500 million from the Innovation and Technology Fund. (ii)On top of implementation of Clinic Management system, Backup & Ticketing system can further optimize the operation in clinics. Data backup is of utmost importance when talking about data security nowadays. Storing data in the Cloud can even ease of threats of fire, flooding or theft. Ticketing system is one of the means to enhance patients' satisfaction and reduce workload from nurses. Mr. Ellman Law, Senior Manager in Solution Consulting of ELM Computer Technologies Limited, has over 20 years of experience in participating in IT and solution consulting activities in Hong Kong. Mr. Law has provided solutions for various organizations covering both commercial and the Government in areas including infrastructure design, application integration, cloud solution implementation. Mr. Law also has helped organizations to participate in moving their businesses to cloud andtaking advantages of big data analysis and Internet of Things. The market for the internet of things in healthcare is growing steadily, with applications ranging from remote monitoring to smart sensors and medical device integration. It has the potential to not only keep patients safe and healthy, but to improve how physicians deliver care as well. Healthcare IoT can also boost patient engagement and satisfaction by allowing patients to spend more time interacting with their doctors. In this session, we will look at some of the current applications, and explore the challenges and benefits of healthcare IoT. Dr K F Tsang joined City University of Hong Kong (CityU) in 1988 and is now an Associate Professor and also the Director of Wireless Sustainability Center, Department of Electronic Engineering, City University of Hong Kong. KF has been enjoying his teaching, research and services at CityU. Besides, KF has been working closely with the industry on numerous Internet of Things (IoT) development. His former work included the design and development of a 3G data decoder, strongly encrypted wireless links for utilities, a portable GSM cellular phone, mobile phone infrastructure, wireless home/office automation system, security system, pager, two-way radios including FRS and PMR, the investigation of electromagnetic interference, etc. He has been working actively on RFID (ZigBee), LTE as well as WiMax development. Applications include ZigBee Telehealth systems, ZigBee energy management systems, WiMax CPE, security system, LTE amplifiers, building automation, ... etc. KF has published about 200 technical paper and four books/chapters. He has been actively engaged in professional activities including the Interviewer for CEng IET (2002 till date), the Chairman of IET Electronics Section 2003-5, The Chairman of IEEE Consumer Electronics Hong Kong Chapter 2008, the Chairman of Chinese Institute of Electronics Hong Kong 2006-2010, the Chairman of the "Internet of Things Special Users Group Hong Kong" (2015-date), the Chairman of HKIE Electronics Division (2015-16), the Chairman of Technical Committee "Cloud and Wireless Systems for Industrial Applications" of the IEEE Industrial Electronics (IE) Society (2015-date). To help promotion of IoT activities and offer expert advice and recommendation to the Hong Kong government, KF has been made the Founding member of the Smart City Consortium (SCC) as well as the Chairman of "Internet of Things" Committee. Deadline for registration is 24 July 2017. 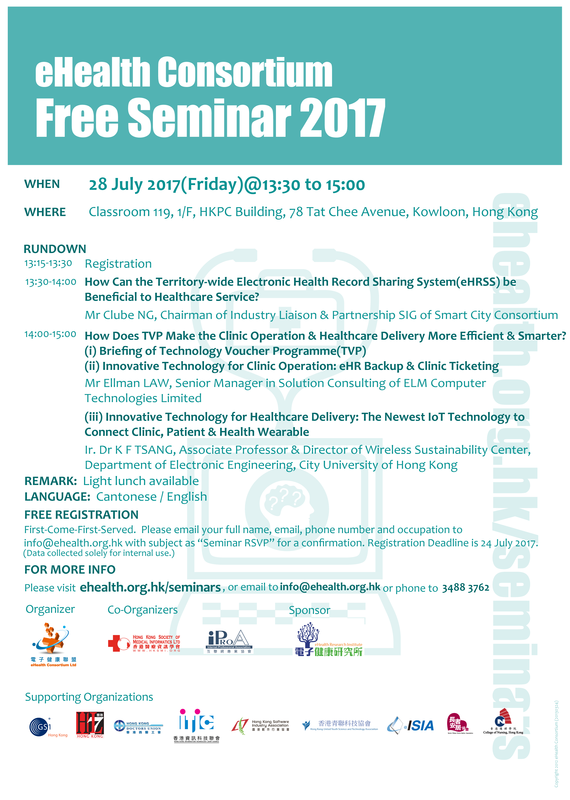 Please email your full name, email, phone number,occupation and company name to info@ehealth.org.hk with email subject as 28 July Seminar for a confirmation. (Updated on 6 July 2017) Stay tuned for information on our next seminar!